We took a scooter, which looks like a tricycle. In fact that’s what it is, but it coped with kerbs, cobblestones, tramlines and everything else the modern continental city has to impede the progress of visitors. We arrived, dumped the scooter, I hopped into the rented manual wheelchair and sought directions to the closest decent pub. About 11.30pm local time, we were drinking beer in the street, watching people go by. No feeling of menace, late night lunacy or anything like it. It took a while to get used to. 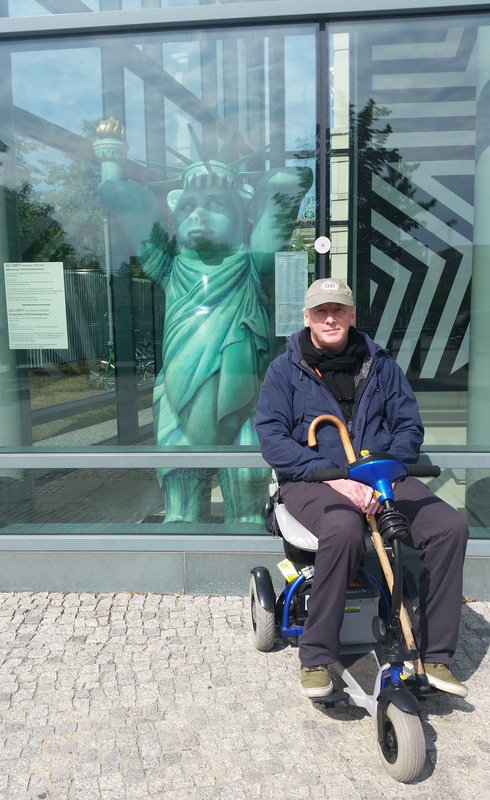 There’s a reason you don't see manual wheelchairs on the streets of Berlin. They don't work. Berlin has, for the convenience of its squadrons of bicycle users, small squared off kerbs about an inch high which won't bother a bicycle wheel but will stop the front casters of a chair dead. Do not jaywalk. Not because it’s illegal, it is. It’s also a good way to get dead. Berlin has public transport and - unlike the UKs public transport - it’s a joy to use and completely integrated. Their employees look embarrassed, but quite proud, when you tell them how good it is. The Kaiser Wilhelm Memorial Church for a bit of peace and spiritual recharge. And Museum Island - all of a sudden, the first Indiana Jones film makes perfect sense. I tend to prefer the more comfortably cut, Fusions or Striders. They seem remarkably untroubled by currywurst (I’m sitting a lot) The gloves are bulletproof (I’m hard on gloves). And the best thing ever is a lightweight Dale Jacket. Under a Barbour, over a fleece or on its own, it weighs nothing and scrunches into a ball, but you'd never know it to look at it.